Thanks to Matt for sending us this nice shot of a beautiful big brown he caught recently, which is just one of many big fish pics he sent us. Caught last week in the southern tier of NYS. I’m fortunate to not only have a cabin on one river but only fish during the week, when virtually only 5% of the anglers that are present on weekends fish. 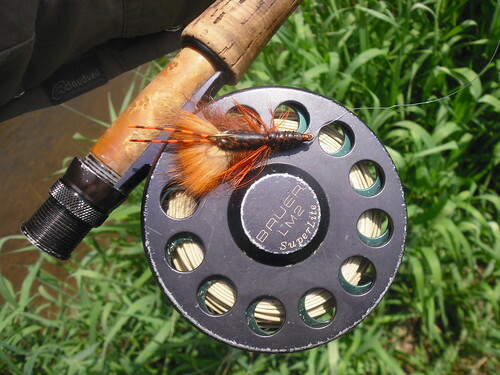 The fish ate a #14 Rusty spinner with CDC wings, split tails, a turkey biot abdomen and fur thorax on 6X. This entry was posted in fishing report on May 31, 2010 by Jason du Pont. 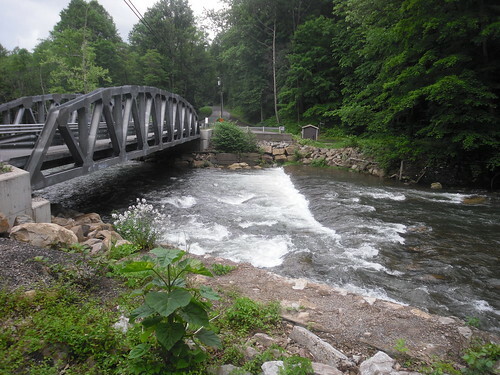 The Gunpowder river is flowing at 123 CFs, is clear and 63 F. Seasonally warm water temps influenced by surface water spilling over the dam have been moderated by a gate change earlier in the week. If you’re heading out early, caddis in the #18 range are a good bet. Small soft hackles fished in the riffles between Masemore and York Road have accounted for a number of fish this week. Spend the afternoons swinging snowshoe rabbit emergers and unweighted pheasant tails. This weekend: Go to the picnic but sneak back to the river at dusk to take part in the Sulphur spinner fall. Well, what a difference a few days make! After a poor weather outing last weekend that had me questioning my fishing skills, Tuesday night was a different story altogether! I took your advice and fished upriver, starting a the dam and working down pretty quickly. –Used a Caddis and a pheasant tail dropper and this rig accounted for about a dozen fish between the dam and the big bend where the trails divide. Several slaps at the caddis but all the landed fish came on the dropper. Once the sun went in a bit the Sulphurs started emerging in waves and I had a banner day. I used the Unusual, both in the orange I got at the shop and in a pale yellow I tied myself in size 16-18. I used a size 18 parachute sulpur pattern with a trailing shuck which was also deadly. I kept my CDC emergers and spinner patterns close by but never needed them as these two patterns worked steadily until I could no longer see (which was late! The moon was so bright it cast a significant shadow on the water). The best part? Solitude. I only saw one other fisherman from 6pm until almost 9pm and two kayaks. Very quiet and overall a great evening! This entry was posted in fishing report on May 25, 2010 by Theaux Le Gardeur. 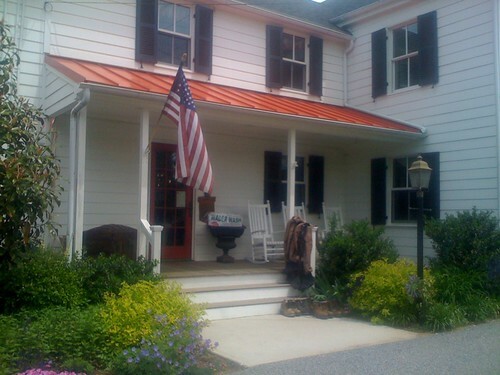 Fly Fishing Maryland? Please join us for an intermediate Fly Tying Class on Saturday, May 29, 2010 from 9:00 AM till 12:00 PM. The class focuses on Gunpowder river Sulphur patterns. Our very own Gunpowder river guides will be teaching this fun-filled intermediate class. Cost of the class is $45 per person, and includes the use of materials. Please bring your own tools.The class is limited to six and pre-payment is required. Please give us a call at 410-329-6821 or drop us a line at info@backwaterangler.com to register. This entry was posted in events on May 18, 2010 by Theaux Le Gardeur. The Gunpowder river is flowing at 95 Cfs, is 62 F and clear. We’ve had reports of blue winged olives sized #18-20, tiny cream midges in the #22 and smaller range and caddis sized #16,in the mornings. Sulphurs have been coming off sporadically through the mid-morning to late afternoon with more flies massing towards dark. Spinner falls are not to be missed this time of year. Plan on dodging afternoon thundershowers and wait out the rains accompanying them the fish still have to eat. The first fireflies of the season are making themselves known and providing the sulphurs with a little light during their late meals. Oh, and be sure to bring a headlamp along if you’re fishing till dark, unless you’re handy with a Mason jar. Thanks to Michael for the following photos and stream report. It has been an eventful month for me, fraught with late evenings and hungry browns eagerly taking dries and nymphs on the upper stretches of the gunpowder. After taking a few fish on a rainy Tuesday evening on a decent sulfur hatch I figured a change of scenery was in order. I decided Wednesday to put away the 4wt and get out the streamer rod and head south of Big Falls for the first time this year. After a long and monotonous day throwing all variety of streamer with little excitement other than a few chubs, I tied on a copper colored zonker that Jason gave me at the shop and headed further south. 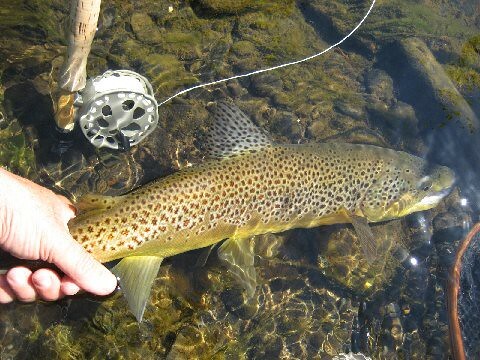 I was eventually rewarded with the beautiful fish seen here, my biggest gunpowder trout to date, possibly in the 15-16” range. Thank you all so much for all the help you have given me over the past year. Cheers! This entry was posted in fishing report on May 17, 2010 by Theaux Le Gardeur. 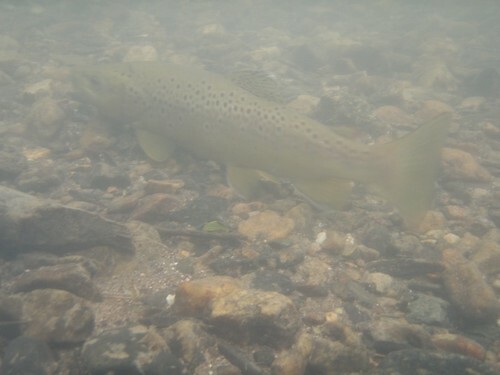 Trout rising to insects is a common sight on the Gunpowder this time of year. Midge, caddis and mayfly hatches during the course of the day keep the trout looking to the surface for a meal. The sulphur hatch is one that tends to send the trout airborne after emerging duns, and seeing trout flying out of the water isn’t unusual. Many reports from anglers this week mentioned fish rising and leaping out of the water along the Gunpowder. I’ve seen this occurring in just about every stretch of river in the afternoon when the sulphurs start hatching. Throw in a midge hatch and intermittent egg-laying caddis toward dark, and the fishing gets interesting. A few anglers relayed that despite the aggressively feeding trout, they found it challenging to get the fish to notice their fly, amongst the naturals. I witnessed a unique sight, where a dozen trout took to the air repeatedly. The fish were consistently leaping two and three at a time for twenty to thirty minutes. The fish were so keyed in on a specific stage of a hatching insect, that it was a better situation to film than to fish. In the latest video post I filmed a dozen three to ten inch browns flying a foot or more out of the water. The brown below took a streamer, so a bigger fly is a good way to get the trout’s attention amidst the hatching insects. This entry was posted in fishing report, video on May 16, 2010 by Jason du Pont. Please join us for a flyfishing school. On Sunday, May 30 , a Backwater Angler Guide will be teaching a fly fishing school that is ideal for beginners. If you’re planning on fly fishing in Maryland, or anywhere else for that matter, this course is a great introduction to the sport. The school covers knots, casting, gear, fly selection and an hour of on-stream instruction. Schools are held in a meadow overlooking the Gunpowder river by a Maryland state licensed and insured fishing guide. Class is held from 11:00 AM till 2:00 PM. Cost is $100 per person and includes the use of gear. A Maryland Non-tidal fishing license and trout stamp is required and may be purchased prior to the class with check or cash at the shop. Class size is limited to 4 and pre-payment is required. Please give us a call at 410-357-9557 or drop us a line at info@backwaterangler.com to register. This entry was posted in events on May 15, 2010 by Theaux Le Gardeur. Please join us for a flyfishing school. On Sunday, May 23, a Backwater Angler Guide will be teaching a fly fishing school that is ideal for beginners. If you’re planning on fly fishing in Maryland, or anywhere else for that matter, this course is a great introduction to the sport. The school covers knots, casting, gear, fly selection and an hour of on-stream instruction. Schools are held in a meadow overlooking the Gunpowder river by a Maryland state licensed and insured fishing guide. Class is held from 11:00 AM till 2:00 PM. Cost is $100 per person and includes the use of gear. A Maryland Non-tidal fishing license and trout stamp is required and may be purchased prior to the class with check or cash at the shop. Class size is limited to 4 and pre-payment is required. Please give us a call at 410-357-9557 or drop us a line at info@backwaterangler.com to register. Small to medium size streams are abundant throughout Maryland, and many are downright scenic this time of year. Some of the streams support trout, either stocked or wild, but many also hold populations of bass, panfish, carp and other assorted coarse fish. The joys of fishing these types of places include not needing a big selection of flies, less wary fish, and rarely having to wear waders. The idea is an easy day of fishing where each cast may bring in a different species, and the fly choice boils down to either a black or white wooly bugger. I’ve always enjoyed covering new water and exploring different places, even when in many cases the fishing is hit or miss. Many anglers lament doing the legwork on unfamiliar water, but not knowing what is around the next bend is the pull for me. In the latest video I shot some footage of a variety of water while on my travels recently, including high gradient and meadow stretches. I caught ten small mouth bass in one spot where wild flowers were blooming, and the bass were putting up a nice fight on a four weight rod. Nearly every county in the state has streams that if they don’t hold trout, may have good populations of warm water fish. 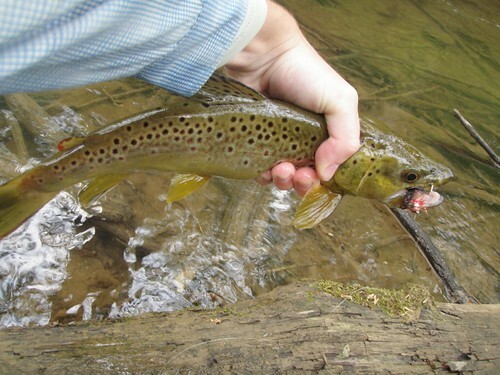 The adventurous angler has numerous opportunities for a variety of fish, in all types of water throughout Maryland. This entry was posted in fishing report, video on May 9, 2010 by Jason du Pont.